Click on the image to visit Catch My Products. My humorous thoughts about life. Enter for a chance to win one of two gift cards to TpT that you can spend on our upcoming sale. Woo hoo! Plus, Catch My Products will be 20% off. 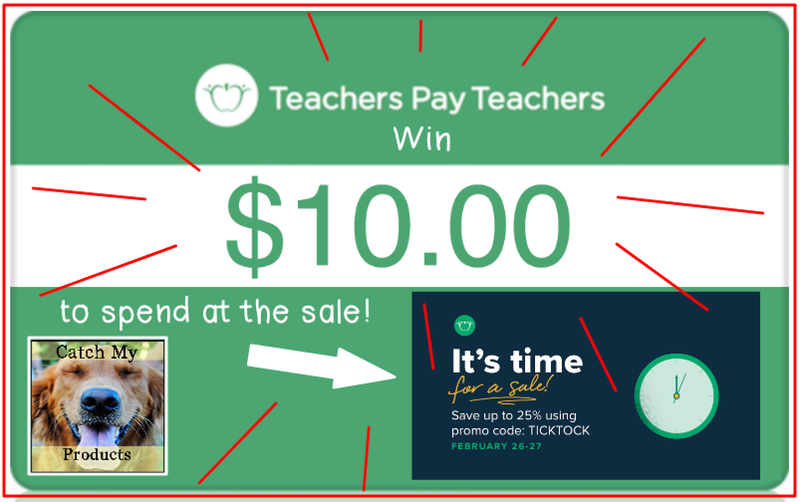 I am participating in another TpT Giveaway! Rules: Use the Rafflecopter to enter. Giveaway ends 2/13/19 and is open worldwide. Click here to find the rafflecopter! I woke up to a wonderful Super Bowl tradition. A lox box with a poem was waiting outside my door. This is a local synagogue's fundraiser that has been going on for years. My mother-in-law used to send these out, but she died in September. My husband sent boxes to several in her memory. After devouring my delicious bagel and lox, this morning, I started work on another Super Bowl tradition. I posted for our sale. I've joined with several Teachers Pay Teachers authors in TWO game day sales. 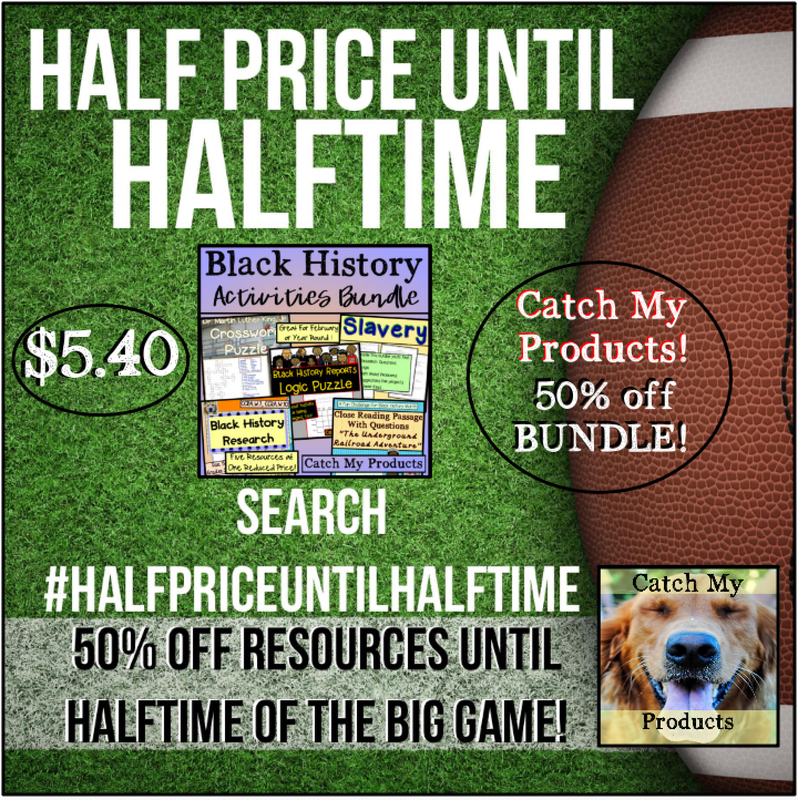 First, we have the #halfpriceuntilhalftime hashtag sale. 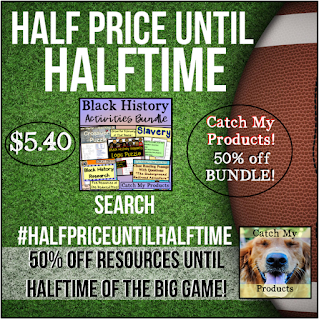 I'm featuring my Black History product at 50% off. To be honest, I wanted to make it half off of it's normal 30% off, but TpT does not allow us to give away products, so it's on sale for $5.40, which is half off what it would be if you were to buy all of the products inside of the bundle, individually. 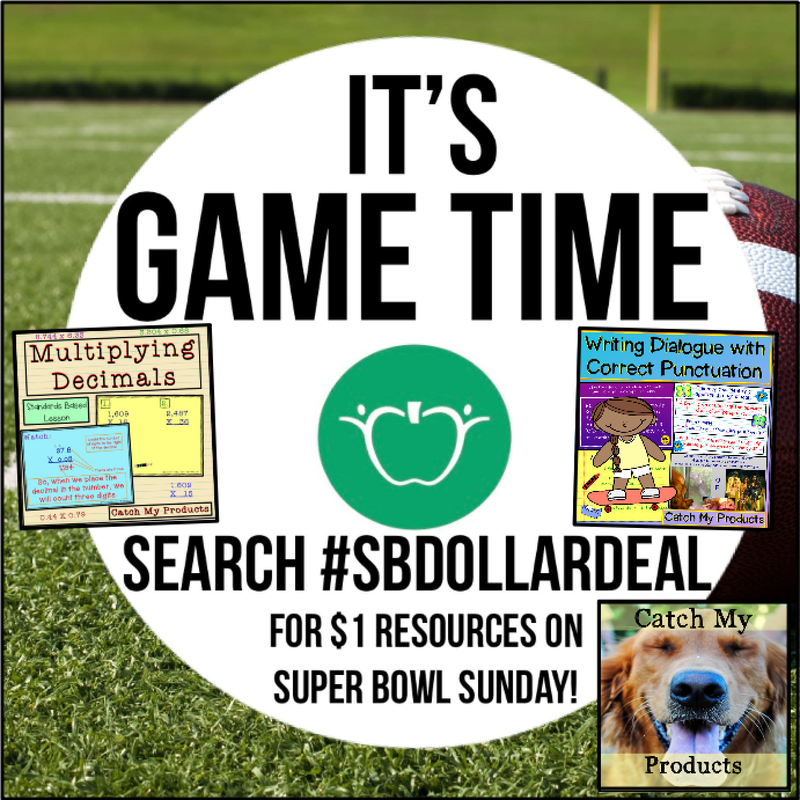 I'm also participating in the #sbdollardeal hashtag sale. 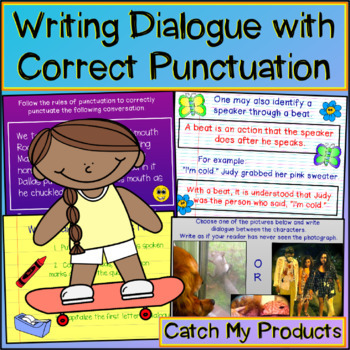 I'm featuring Multiplying Decimals and Writing Dialogue, each for just a dollar, today only. So go to TpT and search the hashtags for some great bargains! Take your students on a reading adventure about runaway slaves with this original story from Catch My Products. Through this close reading passage, students will learn what it was like to be a runaway slave from around 1860s, America. Students will remain engaged with the story and intrigued with higher level, critical thinking questions. Although slavery was an embarrassing mark on American history, students need to learn about this chapter of history. This packet will engage and challenge your students with standards based lessons from multiple subject areas. Eight individuals are highlighted in this research page. Once students match the individual to his or her description, they must unscramble letters to reveal the occupation of the famous person. It’s February, which means time for the boys––Randy and Tylis, and the girls––Aundrea and Jasmin––to complete their black history reports. Each kid had someone special to write about, so they visited to the library to learn about their famous Americans. 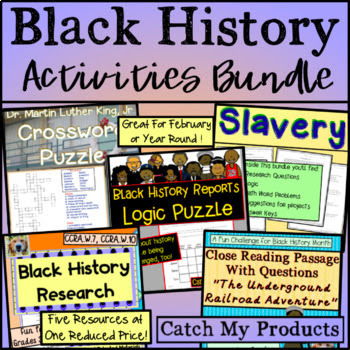 Students will read about four trendsetters from Black History and determine who researched which person. January marks the birthday of Reverend Martin Luther King, Jr. To celebrate, answer the questions below, using the word box to complete the crossword puzzle.Students will enjoy researching the answers to this fun and engaging puzzle. Just when you thought all giveaways were ending, here's a new one! Click this link to enter. Best of luck! 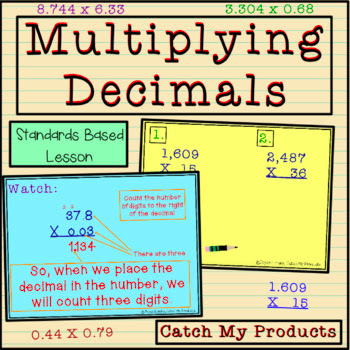 Follow Joyce's board TeachersPayTeachers on Pinterest. Click image & you're there! Visit Joyce's profile on Pinterest. Push the fence button to vote for my blog. Thanks!